The full-blown recession has hit behavioral health hard. More people need help. Fewer can afford it. How are clients and providers faring? It has become virtually impossible to ignore bad news about the economy. Every day, Americans are bombarded with reports of slumping stock markets, massive layoffs, and dismal business forecasts. Many are experiencing these phenomena firsthand. And it’s increasingly apparent that the constant onslaught of economic gloom and doom is not only impacting people’s wallets—it’s also affecting their psyches. Social workers and other professionals around the country report that the slowdown has put an enormous amount of pressure on their clients. For many clients, the stress is too much to handle. They are falling victim to anxiety and depression and trying to ease their fears with alcohol and other drugs. Such responses are not uncommon during times of economic turmoil, but the situation may be more dire this time around. There are signs that people are already cutting back or foregoing services in an attempt to save money or because they no longer have insurance coverage. Observers say they fear that if this skimping continues for an extended period, it will result in an eventual influx of people with major problems—an influx the system may not be able to handle. Anecdotal evidence suggests that the recession is becoming a top reason why people are seeking mental health services. For example, several national insurance companies report that more people are using their employee assistance programs (EAPs). These programs offer employees a confidential way to access short-term counseling and connect with services such as child and elder care. Philadelphia-based CIGNA Corporation has seen calls to its EAP climb 60% during the months following the financial collapse in the fall of 2008, says Doug Nemecek, MD, the insurer’s national medical director. Representatives of Hartford, CT-based Aetna Inc. and Indianapolis-based WellPoint, Inc. say their companies also have seen increases. Not only is the number of calls to EAPs going up, the topics of conversation have shifted away from traditional issues such as marital stress and family discord to job troubles, struggles with mortgages, and financial stress, Nemecek says. “Clearly, there are people who have struggled with anxiety, depression, or substance abuse, and the economic crisis has made their problems worse,” he says. More people also are reaching out to providers of community-based mental health services. Members of the New Jersey Association of Mental Health Agencies, Inc. have seen a roughly 20% increase in demand for services since the late summer of 2008, says Debra Wentz, PhD, the association’s CEO. Crisis calls are going up, and more people are reporting stress-related physical symptoms such as stomach ulcers and headaches. It’s been busier for the staff of the Family Involvement Center, a nonprofit organization in Arizona that helps families with children who have behavioral health needs. Many of the children the center serves sense their caregivers’ increased stress and are exhibiting more anxiety and frustration at home and in school, says Jane Kallal, the center’s executive director. At the same time, Boys & Girls Clubs of America and other nonprofits that traditionally provide recreational and educational outlets for youth have to cope with reduced donations, Kallal says. Changes have been felt in the world of substance abuse treatment as well. Until a few months ago, the majority of people seeking help at Townsend, a chain of outpatient facilities in the Southeast, had a primary diagnosis of prescription drug addiction. Now, the majority of new clients are addicted to alcohol. Alcohol is the current drug of choice because it’s cheaper than other addictive substances, says Michael Handley, CEO of Destin, FL-based Townsend. Jodi Conway, LCADC, who runs a private practice in Dumont, NJ, says many of her clients are having trouble kicking their addictions or are relapsing because of financial stress. The effects aren’t limited to patients with alcohol or drug addictions. The downturn has renewed interest in research related to the psychological effects of financial stressors, particularly unemployment. Recent reports have linked job displacement and unemployment to lower rates of participation in social activities (Brand & Burgard, 2008), lower levels of mental health (Cassidy & Wright, 2008; Scutella & Wooden, 2008), and heavy drinking (Mossakowski, 2008). The psychological impact of unemployment can be deep and long lasting, says Arthur Goldsmith, PhD, the Jackson T. Stephens professor of economics at Washington and Lee University in Lexington, VA. Even though many people initially see unemployment as a chance for a new start, research done by Goldsmith (Goldsmith, Veum & Darity, 1997; Goldsmith, Veum & Darity, 1996) shows that optimism is often replaced by hopelessness, depression, anxiety, and low self-esteem as unemployment lingers. Even though the need for mental health and substance abuse services has increased because of the recession, that doesn’t mean all providers are seeing more patients. Financial difficulties are forcing many clients to choose cheaper, less-intensive forms of treatment. Mental health providers in Minnesota have seen more people asking about free medications and sliding scale fees, says Sue Abderholden, MPH, executive director of the state’s chapter of the National Alliance on Mental Illness (NAMI). Abderholden says she expects many people to forgo traditional treatment and seek less-expensive alternatives, such as support groups, fitness classes, yoga, and meditation. Kallal says parents served by the center have formed informal support networks to help each other out during tough times. Some people are turning to the Internet for help. A few months ago, the Ruth Rales Jewish Family Service in Boca Raton, FL, launched several Web sites where people can go to receive counseling via e-mail. The organization decided to start the service to cater to the increasing number of people using the Internet to look for jobs and employment advice, says Mark Cherny, LCSW, the organization’s supervisor of outreach and community services. The online counseling has attracted e-mails from people throughout the United States and Canada who are struggling with financial problems. Cherny says his responses to these messages are designed to help people realize that they are not alone in their struggles and to remind them that they have strengths they can tap into to respond to crises. He also refers people to support services in their local areas. As clients look for less-expensive services, social work practitioners who offer traditional in-person psychotherapy are trying to find ways to make their services more accessible to clients. Charles Rizzuto, MSW, a faculty member of the Smith College School for Social Work in Northampton, MA, who also has a private practice, says he has had to become more flexible with how he charges and collects fees, even if that means he has less income. Similar trends are emerging in the substance abuse field. Conway says many of her patients are spacing out their appointments and relying more on 12-step programs. Wiedemann-West says her organization’s outpatient business has picked up in recent months while demand for its residential services has declined. Insurers are more likely to pay for outpatient treatment, and people are increasingly averse to leaving their workplaces for inpatient treatment, she says. Handley believes economic trends mean bad news for inpatient treatment centers that rely on self-paying clientele. Many of those providers may go out of business if economic trends continue, he says. Some providers that cater to self-pay patients already are feeling the effects. The census at California-based Creative Care Inc., which offers dual-diagnosis services, has fallen about 25% in the past 11⁄2 years. The organization expects the downturn to continue for another six to 12 months, says founder Morteza Khaleghi, PhD, who also is the author of Free From Addiction: Facing Yourself and Embracing Recovery. A prolonged economic slowdown could have disastrous consequences for people struggling with mental health problems and addictions. Many people who cannot afford to access the services they need will eventually enter the system when they are much sicker or even suicidal, says Sita Diehl, MSSW, executive director of NAMI’s Tennessee chapter. And it’s unlikely that states—many of which are facing multibillion-dollar deficits—will be able or willing to provide more funding for services, Diehl says. Some observers are hoping that President Obama’s administration may kick-start the economy and provide the impetus for fundamental reform that will make mental health and substance abuse services more affordable and accessible. Yet, it is unlikely that any changes will happen soon, says Abderholden. 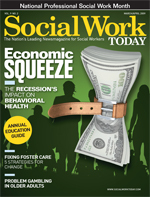 No matter what happens, the downturn has at least raised the public’s awareness of the importance of social workers’ role in helping people struggling with mental illness and addiction, says Dennis Derr, EdD, director of EAP products for Aetna Behavioral Health. Brand, J. E., & Burgard, S. A. (2008). Job displacement and social participation over the lifecourse: Findings for a cohort of joiners. Social Forces, 87(1), 211-242. Cassidy, T., & Wright, L. (2008). Graduate employment status and health: A longitudinal analysis of the transition from student. Social Psychology of Education, 11(2), 181-191. Goldsmith, A. H., Veum, J. R., & Darity, W. (1996). The psychological impact of unemployment and joblessness. Journal of Socio-Economics, 25(3), 333-358. Goldsmith, A. H., Veum, J. R., & Darity, W. (1997). Unemployment, joblessness, psychological well-being and self-esteem: Theory and evidence. Journal of Socio-Economics, 26(2), 133-158. Mossakowski, K. N. (2008). Is the duration of poverty and unemployment a risk factor for heavy drinking? Social Science & Medicine, 67(6), 947-955. Scutella, R., & Wooden, M. (2008). The effects of household joblessness on mental health. Social Science & Medicine, 67(1), 88-100. As the nation continues in a period of economic uncertainty, many of the 50 million Americans living near or below the poverty line are more vulnerable than at any time in recent years. Yet, the help they need to get a job, locate housing, access healthcare, or provide for their children is less likely to be found in their neighborhoods as agencies serving the poor face potential financial problems of their own, University of Chicago research shows. Location is important because, contrary to popular impressions, most assistance to low-income families comes in the form of social services, which support work activity and promote greater well-being among the poor, and not cash payments. Today, for every dollar of welfare cash assistance, the United States spends about $15 on social service programs delivered typically by nonprofit agencies but often funded through the government, says study author Scott W. Allard, PhD, an associate professor in the School of Social Service Administration at the University of Chicago and author of the book Out of Reach: Place, Poverty, and the New American Welfare State. The findings are based on the Multi-City Survey of Social Service Providers that Allard conducted from June 2004 to August 2005. But these programs are vulnerable in today’s current economic environment, as social service programs are often among the first places governments look to cut when tax revenues decrease. Private philanthropy dedicated to social services—another critical source of funding—also declines during economic downturns. Ironically, funding to service programs is cut right when the need for help is rising. Programs also are not well matched to need, according to Allard. His study of social service agencies in Chicago, Los Angeles, and Washington, DC, shows that about 70% of the high-poverty neighborhoods have low levels of social service provision, meaning that such neighborhoods have no social service agencies or are proximate to only a few extremely overburdened agencies. “In Chicago, almost 80% of the high- and extremely high-poverty neighborhoods are in areas with low levels of service accessibility,” he says. In Los Angeles, 72% of extremely high-poverty neighborhoods have low levels of service, while in Washington, DC, 63% of the neighborhoods have low levels of service. “That means that in a poor neighborhood, there may be five or six people in line for every client slot, while in a better-off neighborhood, there only may be one or two people per slot,” Allard says. In addition, Allard’s research shows that nonprofits often do not locate employment, education, mental health, and many other types of services in high-poverty areas because affordable office space is hard to find. In neighborhoods that are gentrifying, rent on existing office space is often increased beyond the means of the nonprofit organizations. In addition to maintaining public commitments to service programs and developing better systems to connect poor persons to services available in their communities, Allard recommends strengthening efforts to promote private giving to nonprofit service providers and cultivate greater service capacity among existing faith- and community-based nonprofits that are working in the most impoverished neighborhoods.